First Lady, Sandra Granger, on Monday, took her Self Reliance and Success in Business workshop to a group of businesswomen in Mahdia, Potaro-Siparuni (Region Eight), who were eager to capitalise on the opportunity to learn skills to advance their small businesses, a release from the Ministry of the Presidency said. Residents came from Tumatumari, Micobie, Campbelltown, Prince-ville, Mahdia Central and other areas. Mrs. Granger said that the workshops are funded by the Ministries of Social Protection and Indigenous Peoples’ Affairs. Twenty-five women and one man, who asked to be included, are participating in the session at the boardroom of the Regional Democratic Council. 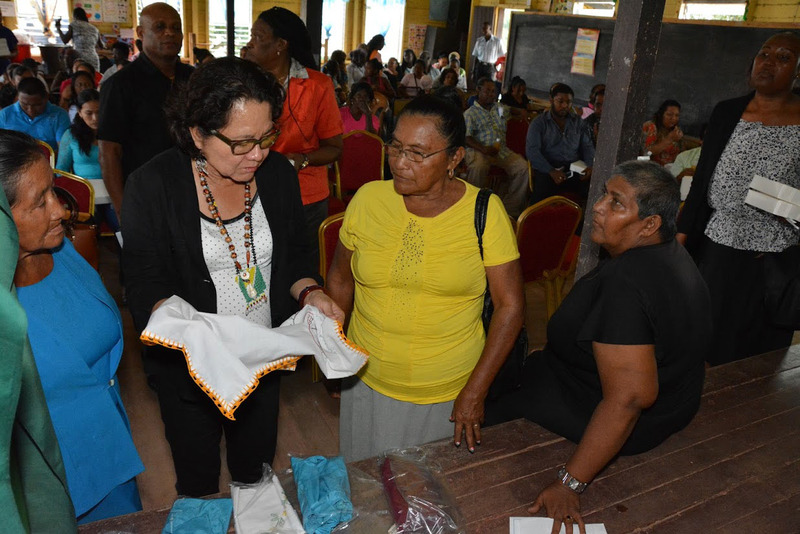 The participants include St. Lucian born Theresa Johnson, who has lived in Mahdia since the 1960s, and they own a variety of businesses, including groceries, clothing retail shops, restaurants and beverage shops.